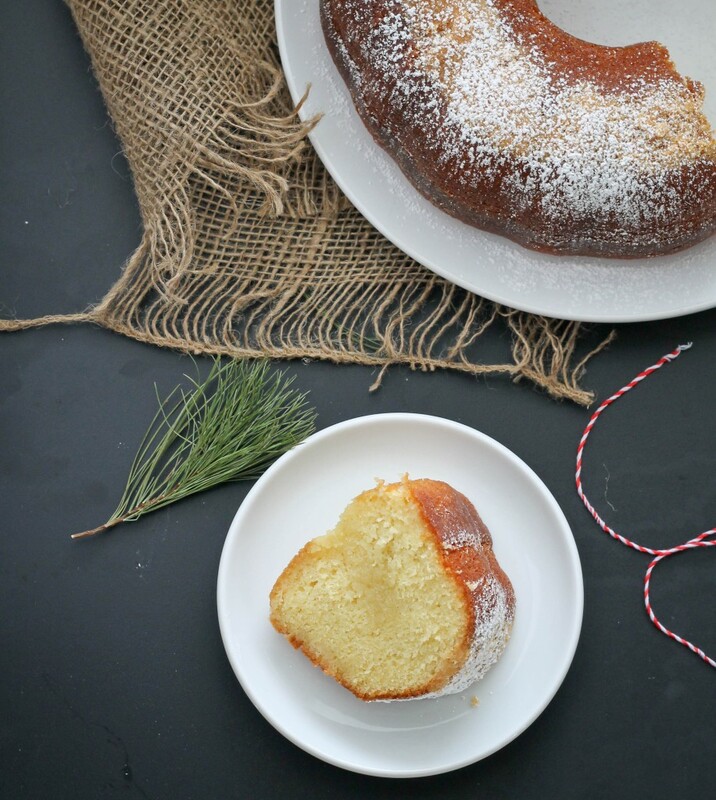 If you’re not familiar with the famous Tortoga Rum Cakes then you are in for a treat! I first had a taste of these moist, buttery cakes a few years ago and have been hooked ever since. I’ve been searching the internet for a version that comes close but most were made with a cake mix. I was looking for a version that was made from scractch when I stumbled on this recipe from King Arthur Flour. 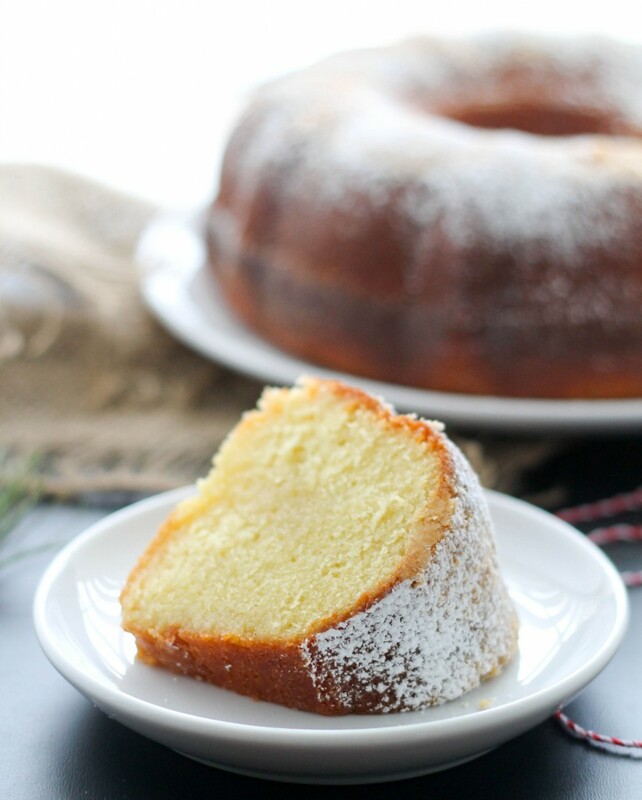 Let me tell you, this cake is unbelieveable good and so moist! You first bake a rum flavored cake then while it’s warm you pour a buttered rum sauce over it and the cake just soaks it up. It’s best to let it sit overnight; I ate the cake after and few hours and while it was good, it was even better the next day! To make the Cake: Preheat oven to 325 degrees. Spray a 10-12 cup bundt pan with cooking spray then sprinkle almond or pecan flour to coat evenly. If the flour drops to the bottom of the pan, that’s ok also. This happpened to me and it just formed a lovely crust on the top of the cake when I took it out of the pan. Place flour, sugar, softened butter, instant vanilla pudding mix, baking powder, salt, vegetable oil, milk and eggs in a large bowl and blend using a mixer for 2 minutes. Be sure to scraped down the side of the bowl as needed. Add rum, vanilla and butter rum extract then mix for an additional minute. Pour the batter into the prepared bundt pan and level with a spatula. Place in preheated oven and bake for 50 to 55 minutes. Cake is down when the top springs back when touched. 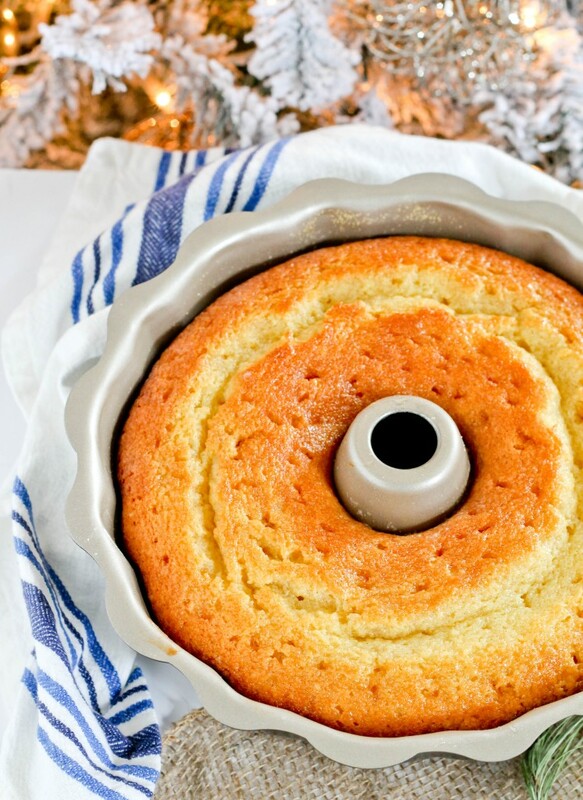 Place the cake on a cooling rack to cool for a few minutes while you prepare the syrup. Do not remove cake from pan, you will need it in the pan so that you can soak it in the syup. To make the Rum Soaking Syrup: In a medium sized pan, place butter, water, sugar and rum and bring to a rapid boil over medium heat. Reduce to a simmer and cook until thickened slightly, about 5-8 minutes. Remove from heat and stir in vanilla. Use a long skewer to poke holes all over the cake. Pour 1/4 of the syrup on to the cake, once that soaks in, repeat until all the syrup is used. Don’t worry if it looks like too much, the cake will soak it all up. Cover and allow it to sit overnight at room temperature. When you are ready to serve, loosen the edges of the cake with a knife, then invert onto a serving platter. Enjoy! Hey Jehan! So a little story. When I was younger my aunt and uncle always ordered this Caribbean rum cake from a little old Filipino lady for christmas. And I would kill it. All in all I was getting semi drunk not realizing it was the cake. Until I tried making it myself now that I’m an adult. Anywho, I’ve been experimenting with this cake and only finding recipes using yellow boxed cake. It was okay. You can taste the premade box-ness. I’m glad I have found your version but I’m curious. What brand of rum did you use? Thanks a million for your blog! Hi, can anything be used as a substitute for the instant pudding mix? Not finding that here in Trinidad. Love your site by the way! Hi Jehan I’m just making sure that you really mean salted butter instead of UNsalted butter for the cake mix (the original says unsalted). Just double checking b/c I know this is your version and I don’t want to make a mistakeAlso, is the pecan or almond flour really going to make a difference? Thanks! Also, did you use the butter rum flavor? Thanks Kai, you can use pastry cream mix. Check a specialty grocery or cake store. Hi Carol, I did use the buttered rum flavor but have also made it without and it’s still good. I used salted butter. Keep up the good work ! Your recipes are awesome !!! This cake turned out AMAZING!! It was so moist and delicious, my family loved it! I made sure it sat overnight and soaked up the rum butter sauce…. It was truly worth the wait!! Thanks for sharing this recipe! For Kai, I’m also from the Caribbean and you can find jello instant pudding mix on the shelf next to the jello gelatin mix, or close to where you’d get custard powder. According to the original receipt some reviewers have used custard power and reviewer maryjobo said this (“for the pudding mix use 1/3 cup light brown sugar, 2 tablespoons of corn starch, 1 tablespoon of potato flour, and I increased the vanilla extract in the recipe by 1/2 teaspoon.”) substitution worked successfully for her.